Occasionally Harry Potter uses a special Marauder's map to find out how people move at Hogwarts. The interface is pretty simple: at first glance, the map is simply a piece of blank parchment; but when the user says the magical words, ink lines stretch across it, revealing a map of Hogwarts and the location of everyone within the grounds. When I started using Jaiku on my mobile phone two months ago, I had the feeling as if I was using Potter's magical map. In short, Jaiku is about sharing personal micro content such as your 1) presence, 2) availability and 3) location in a network of selected people. 'Presence' can be any kind of information of your present movements, activities or feelings. 'Availability' works the same way as your AIM buddy list: if your phone is on silent, your presence in the address book shows red light, if you're free, it's green. 'Location' refers to the place where you're at. 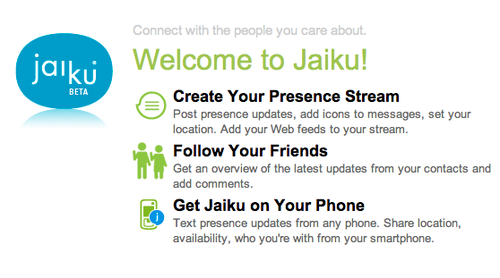 Availability and location shows on your presence stream only if you are using the mobile version of Jaiku. But who cares about your micro content? I have noticed that on daily basis I am mostly interested of my boyfriend's moves; where in the town is he, and when is a good moment to reach him. I can imagine some other "high-interest" people, whose presence I'd like to see: perhaps my mom and dad, my brother as well as some people that work on the same project with me. Then there are lots of people, good friends, with whom I'm not communicating every day or week, but who I like to hear about. "Ah, Julian has just arrived in Berlin..." "Look, Sampo is in town." I also have some Jaiku contacts that I don't personally know. Do I care about their presence or location? Not really. The mobile version of Jaiku feels like a pleasently silent but dynamic shared space, in which you can see other people and feel connected to them without really interacting. Choosing Jaiku contacts is like choosing who do you want to be in the same space with. In this sense it's like Flickr, although perhaps even more personal. I have been test using Jaiku, because my boyfriend Jyri is one of the developers. I've also had the chance to closely follow the evolution of Jaiku, starting from an experiment with an RFID-based presence service called Hunaja at Aula in 2001. When Jyri and I made a user study of Hunaja in 2002, the idea of seeing the presence and availability of your contacts on your phone's address book was already on the table. Congratulations to the Jaiku team for coming this far!